Time until James Patterson's Women's Murder Club: Death in Scarlet release day! 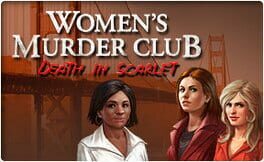 Women's Murder Club: Death in Scarlet is the first game based directly on a James Patterson novel (as opposed to tie-in games to movies based on JP novels). It is a casual adventure title, release in 2008 by I-Play, and designed by renowned game designer Jane Jensen (famous for the Gabriel Knight series).